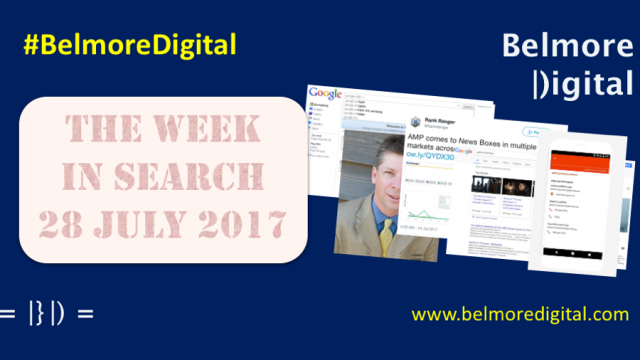 What’s the SEO News & updates for w/e 28 July 2017? As well as some terrifically thought-provoking Bits & Pieces. 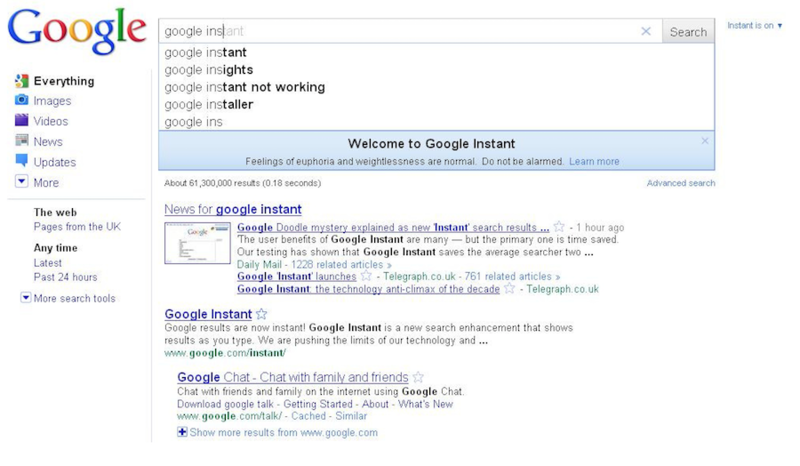 Like the black bar the the top of SERPs and various other Google features, Google Instant is no more. 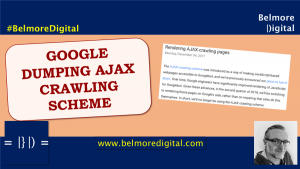 This means, as you type your search, the search results are not going to dance any more as Google pulls results in line with the query. Auto-complete in Google Search should be a more than adequate replacement. There isn’t a huge amount you can do about this, it just is. 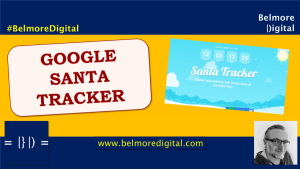 If you were the beneficiary of lots of Google Instant traffic (such as having a long, but unique brand name). then it is definitely worthwhile keeping an eye on Organic Traffic in Google Analytics, and Search Impressions in Google Search Console. In fact, it is probably worthwhile keeping an eye on Search Impressions in Google Search Console, to see if there are significant changes. In most instances, auto-complete should be a more than ample replacement for Google Instant. Contact me if you would like to review issues in Google Search Console and whether this is impacting your site. This is a case of desktop and mobile search aligning, as Google gets ready for Mobile First Indexing. I don’t recall it ever actually working on mobile, so it makes some sense for Google to retire it at this point. Also fewer people had been search on Google itself. The Omnibox / Address bar on almost all browsers now executes the search. 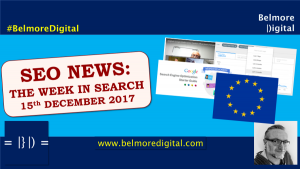 When it was launched, it was going to revolutionise search, and possibly the world, but it never quite reached those dizzy heights. It was a very impressive bit of software wizardry, pulling and refining relevant results instantly, but now, no more. We’ll just have to make do with typing all parts of the query, or doing voice search. The people who are going to be affected by this, are people with long brand names, which would pop up quickly once the first few letters had been typed. Their users are going top have greater instances of RSI as they type the full query rather than relying on Google Instant to fulfil. 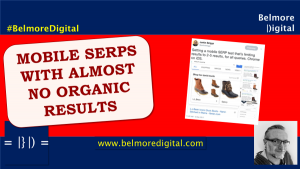 In the wake of some big name departures from the SEO business, people have been muttering the “SEO is Dead” trope. It’s not – there are lots of talented people still in the business, and lots of wise opinions. Perhaps we won’t have quite such a cult of personality in the future, which might allow better information to shine through. Carry on as before. 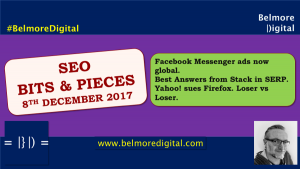 Rand Fishkin (Moz) and Danny Sullivan (Search Engine Land) haven’t been the driving forces behind their sites for a while. Carry on reading the wide opinions published by these sites. Find new people to follow as big as Danny & Rand. 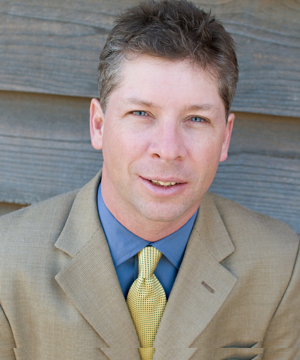 Contact me if you would like to discuss the future of SEO and why it isn’t dead. Rand Fishkin and Danny Sullivan were big names in the SEO industry for a long time. Danny had been writing for Search Engine Land since the mid-1990s, Rand had been running Moz since the mid-2000s. Now they have gone, you would think there might be a gap to fill, but not really in these instances. Danny had been writing less and less for SE Land, same for Rand. He’s almost exclusively been doing Whiteboard Fridays for a while. In terms of impact, they differ. Danny’s role was more of an observer, but possibly had the greater impact on the industry because he disseminated more change than Rand. Moz has had a huge impact on webmasters. I’ve never been a huge fan. I think the tools are under-weight and the metrics are a bit so-so – they look good, but they don’t tell the right story. 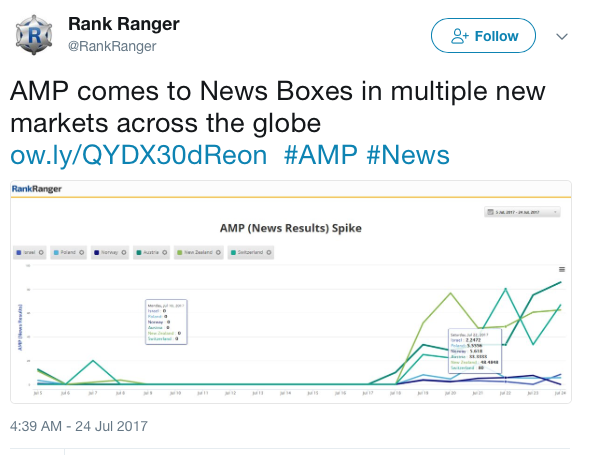 Rank Ranger posted stats on Twitter showing AMP stories are now surfacing internationally. This is slightly chicken and egg – more international news sites have been using AMP, therefore it makes more sense to surface AMP results. If you haven’t already started, you should start implementing AMP now. It will drive more traffic / views / lower bounce rate and with AMP compliant ads, it should also drive revenue. Be aware that AMP is not a “forever” solution, but it’s still a worthwhile investment. 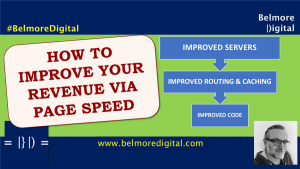 Contact me if you would like to discuss implementing AMP for improved speed and visibility. Slowly but surely, AMP is securing its foothold on the web. I don’t think it is a super long-term solution, but I do think it is worth the investment pain to ensure visibility in search and capture more users using the speed on the service. There are still technical challenges which prevent it always being an easy switch, but it should be fairly straight-forward. It is still noting that getting Analytics data de-duplicated is a bit of a challenge. 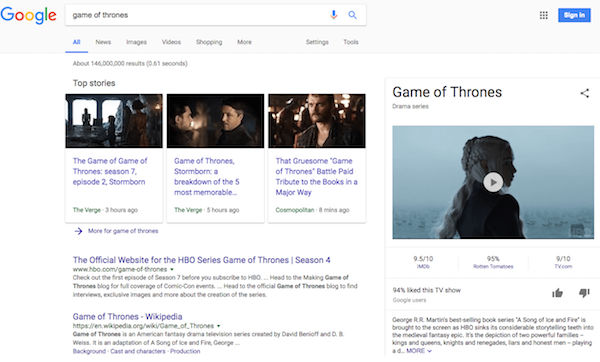 There was a brief test running auto-playing videos in Google SERPs. Lots of people got fairly upset. Luckily, it went away fairly quickly, as Google tests things regularly. 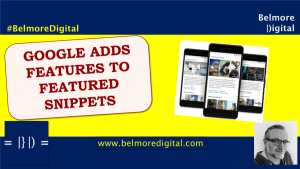 Prepare for auto-playing videos in Google SERPs. Google usually only releases tests like this into the wild if they are likely to surface. Think of them as “release candidate” tests. This means that you should ensure that your videos have a chance of surfacing in SERPs, so create video. If you do create video, auto-play in-feed tends to need to be attention grabbing within 2 seconds, and get the main point across within 6 seconds. Make sure your videos draw people in, before keeping them engaged. Contact me if you would like to discuss ranking video in organic SERPs and ensuring that the videos grab the user’s attention. I think most users (or at least the vocal ones) have a healthy dislike for auto-play videos. They distract and annoy the users. Once the auto-play videos are in SERPs it’s not a huge step to see Google adding pre-roll or mid-roll advertising to these videos. Google did actually used to be one of the internet good guys. Something changed and they are now heading down the rabbit-hole of balancing annoying users and making money off them. There is a chance that with the Google homepage becoming more feed-like, this is a tester for auto-play video in the feed. It’s likely that auto-play also increases overall engagement time on site. Similar to a few steps taken by Facebook over the last couple of years, Google has now launched its own version. These alerts will appear in search results where the user is searching for information relating to it. Also, if users are near to something developing, or on-going, Google is said to pushing mobile notifications to those users. A useful implementation of Location Services. There isn’t really a way to try this out, as it’s generated by a specific event happening. It will be interesting to see it in action. There will undoubtedly be teething problems, or false-positive instances. If you are near to an incident, you should expect to see a notification of some sort pop-up. Hopefully there won’t be an incident, so it never gets tested. Contact me if you would like to discuss this further. Mobiles are the quickest and most immediate form of communication, and this is a good example of using that technology for the greater good, overall. Although you hope it won’t get used, it’ll be interesting to see this technology in action. As with a number of features recently, Facebook, Google and others all seem to be in a features copy cat game at the moment, and I wish they would actually innovate. Oh dear. Google’s new job search engine, Hire, comes with some big SEO faults. 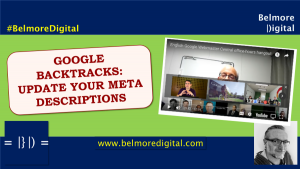 Duplicate titles, missing metas, the usual kind of site you expect from Big Corp sites. On a side note, this job portal is really trying to sneak traffic and revenue away from established job portals. This is a bad thing. 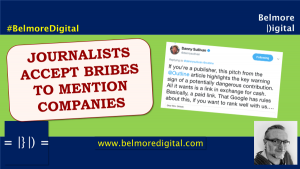 Even though AMP is great, sometimes it just doesn’t work out for you as a publisher and its time to get rid of the content. This is a handy guide to getting rid of the various technical components which drive AMP. Essentially, it’s removing a tag, adding noindex and 301 redirecting. Rank Ranger have posted that 99% of Google’s P1 results have at least 1 HTTPS result. This is not a surprise as 15-20% of the web is now HTTPS, so it would make sense if almost all results returned at least one HTTPS instance. This is a fun take on a serious topic – that of fake review sites with fake reviews of services to drive search appearances for the main site. It’s not a good look that Google has no effective way of separating fact from fiction in these results. It’s also the case in Google My Business reviews – there is a lot of rubbish in those stars. I haven’t been able to generate this yet, but apparently Google is now rolling out sitelinks in a carousel on mobile rather than as an inset drop-down. I’d expect this to roll out over the next few weeks, if it is actually a roll-out. Google Instant has gone the way of the Black Bar. SEO departures don’t signal the end of the world. Google starts to test auto-playing video in SERPs. 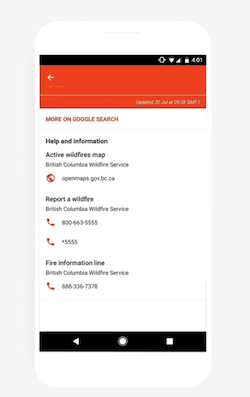 Google adds SOS alerts to search + pushes from location services. 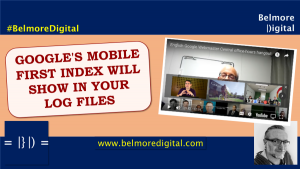 Don’t forget to read about the Mobile First Index. Nor should you forget reading about the State of SEO in mid-2017. Thanks for reading. If you would like to discuss what these changes mean for your web property, or would like to know how to implement them, please feel free to contact me.